Each year, the Sept. 23 anniversary of the destruction of the Vilnius Ghetto is commemorated with readings of the names of Jews who were executed by Nazis as well as by complicit Lithuanian partisans in the nearby Ponary forest. 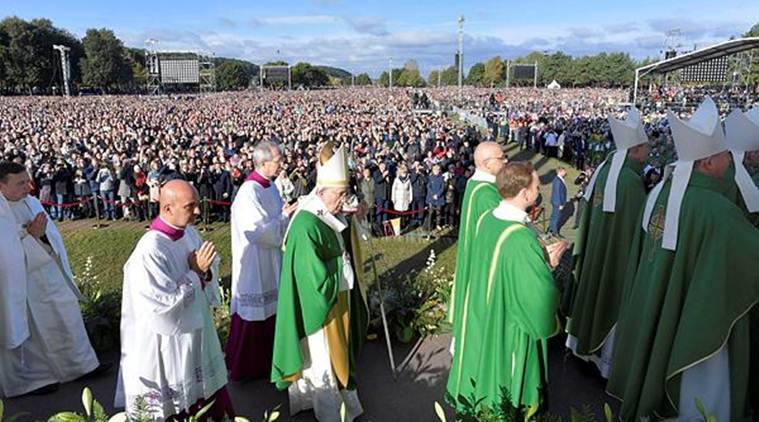 “Earlier generations still bear the scars of the period of the occupation, anguish at those who were deported, uncertainty about those who never returned, shame for those who were informers and traitors,” Francis told the crowd. “Kaunas knows about this. Lithuania as a whole can testify to it, still shuddering at the mention of Siberia, or the ghettos of Vilnius and Kaunas, among others.” He denounced those who get caught up in debating who was more virtuous in the past and fail to address the tasks of the present — an apparently veiled reference to historic revisionism that is afflicting much of Eastern Europe as it comes to terms with the Holocaust. The issue is acute in Lithuania, where ordinary Lithuanians executed Jews alongside the Nazi occupiers, wiping out the Jewish population of the capital of Vilnius that was known for centuries as the “the Jerusalem of the North” because of its importance to Jewish thought and politics. Until Francis’ schedule was changed three weeks ago, there was no event for him to acknowledge the slaughter of some 90 percent of Lithuania’s 250,000 Jews at the hands of Nazi occupiers and complicit Lithuanians. At the last minute, the Vatican added in a visit to the Ghetto. Lithuanian President Dalia Grybauskaite didn’t refer to the complicity of Lithuanians in her remarks Saturday to the pope, but rather spoke of the “lessons of mercy” showed by other citizens during the Holocaust. “In a country brutalized by both Nazi and Stalinist crimes, many people stood up to rescue Jews because they saw humanity as the ultimate good,” she said.